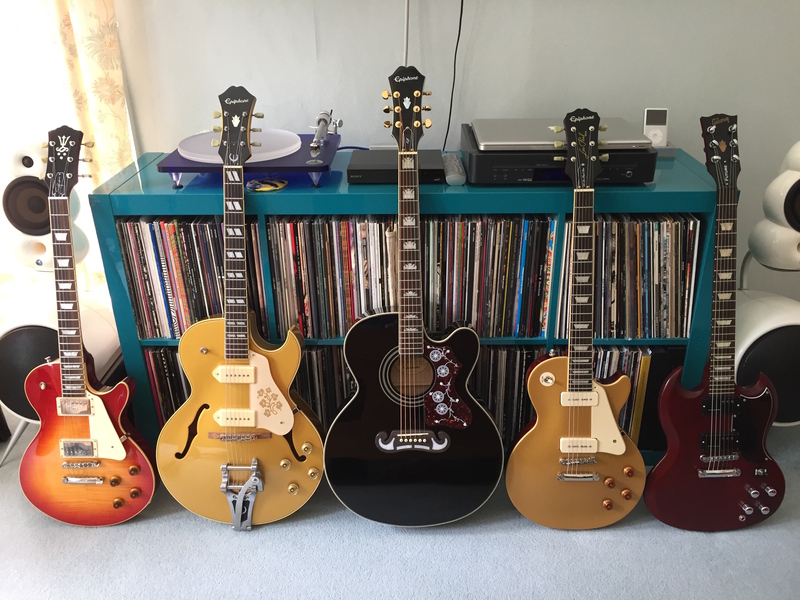 Then Sarah dumfounded me by pointing out that 4 was not a good number of guitars to have, numerologically speaking, 5 would be a much more wholesome place to be. This conundrum resulted in much head-scratching – what could number 5 possibly be? The EJ-200, “King of the Flattop Guitars” in ebony, with a nod to ‘The Man In Black’, was only ever going to be the acoustic for me. 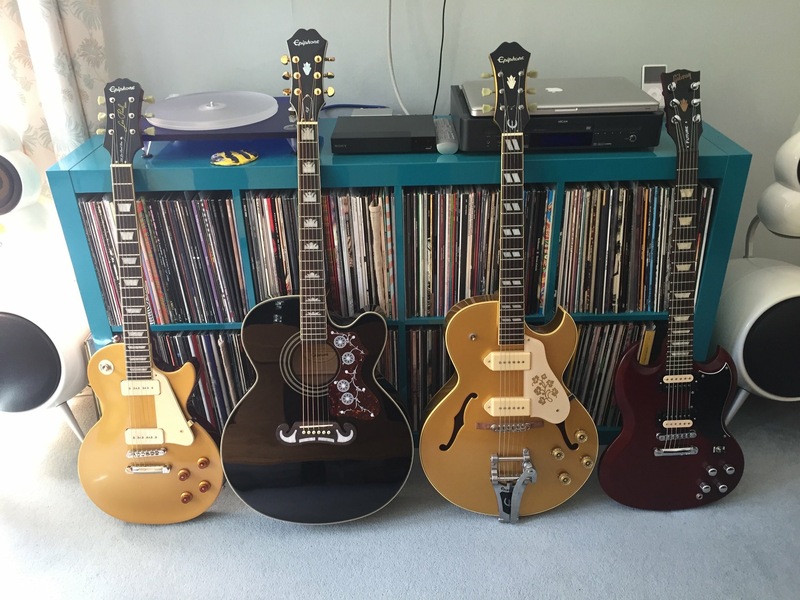 The ’56 Gold Top was an “accident”! 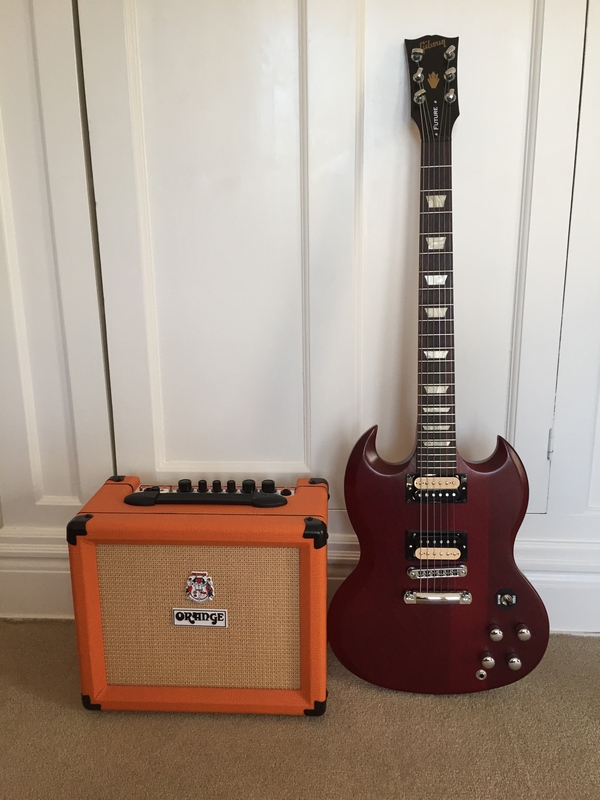 There’s this really passionate, infectious reviewer on YouTube called ‘Steve from Boston’ – he had been instrumental(sic) in convincing me with his review, to buy the SG. One day he reviewed a budget priced Harley Benton Gold Top, basically saying that for the money you’d be crazy not to get one! It turned out they were out of stock, which may have been a godsend because it led me to this Epiphone. As an “exclusive” model, this ‘Standard Pro’ seemed to boast a solid reputation and had become rare as hen’s teeth. Then I found one literally round the corner, not a mark on it and going for close to what I’d have paid for the Harley – P-90 jackpot! With both feet now firmly on “Electric Avenue”, there was just one elusive rock unturned. My devotion to all things Killing Joke, which by definition means Geordie Walker’s ES-295, began gnawing away in the back of my mind. 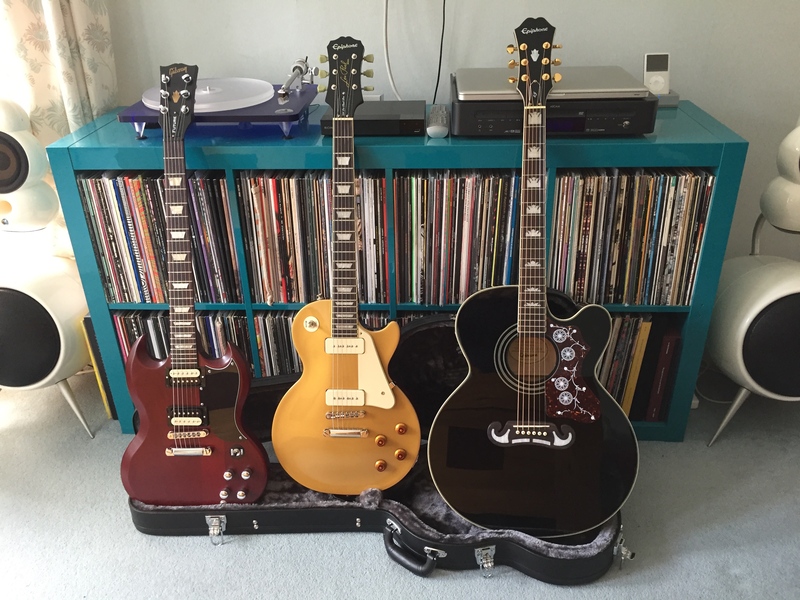 An original Gibson goes for small car money and the Epiphone’s are very few and far between on this side of the Atlantic – particularly since CITES became part of the equation. I trawled, possibly even trolled, every online page, convinced that I’d find “the one”, which I eventually did. (I have to thank Andy here for steering me back to one of the earlier finds I had encountered). There’s just something about the aesthetic of Fender, that doesn’t get my mojo working. (Having said that, I did see an Epiphone Telecaster the other week with a hockey-stick headstock, that really did look the biz!). Apologies to my many Fender friends out there, but no, not for me. 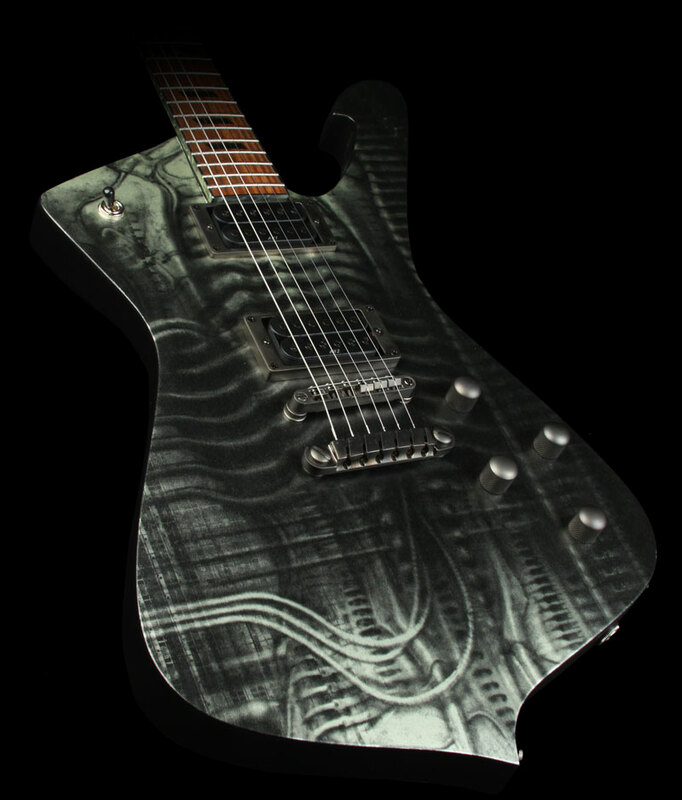 One other pedestal guitar I lust for is Celtic Frost/Triptykon Tom G Warrior’s Giger Iceman – but I think I’d be more inclined to keep it in a glass case, a work of pure art! 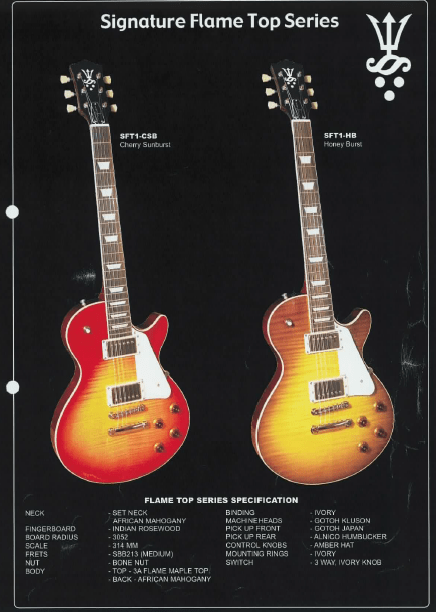 The one that I kept coming back to was another landmark Gibson – a ‘58-’59 Les Paul. An original is obviously out of the question, (who really spends £100k+ on a guitar? 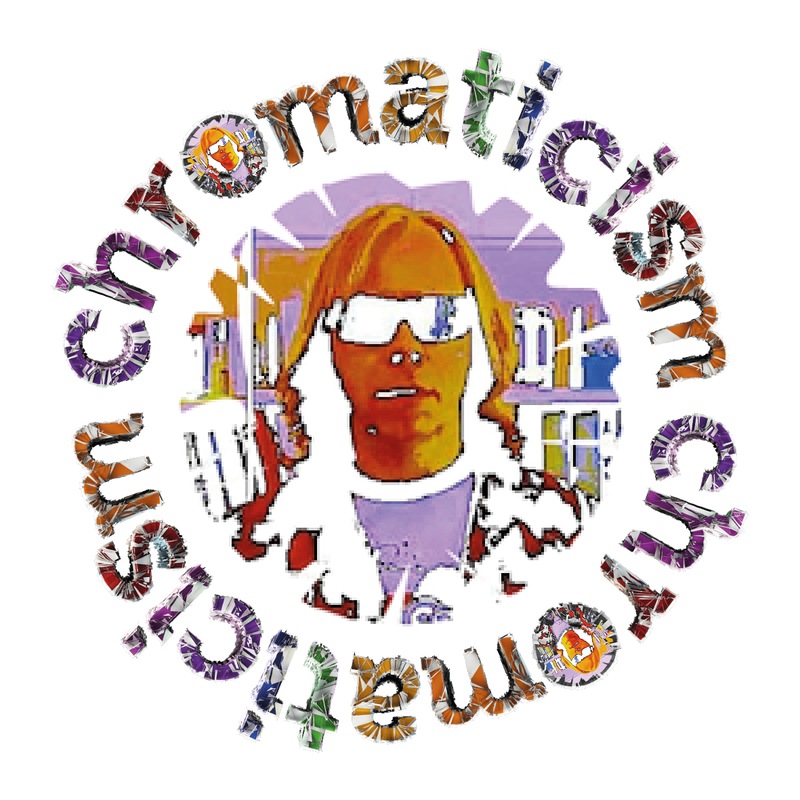 ), even a re-issue is back into small car territory, but the more I read, I began to uncover a host of worthy clones. 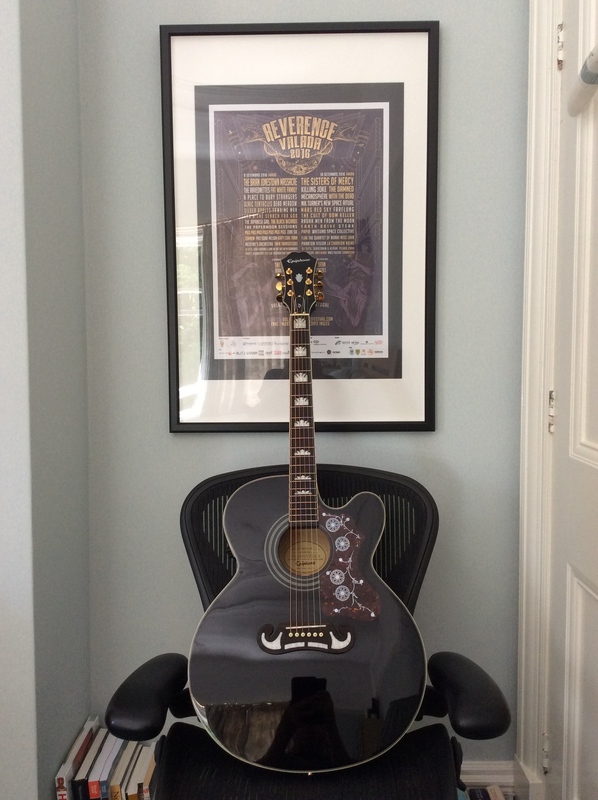 I read every page of every forum and am delighted to present – The Guitar Whose Name Is A Symbol…(John!) Birthed around 2004 on a FujiGen production line boasting Orvilles and Epiphone Elites, this Signature SFT1-CSB is built to much the same spec as a 2004 R9. 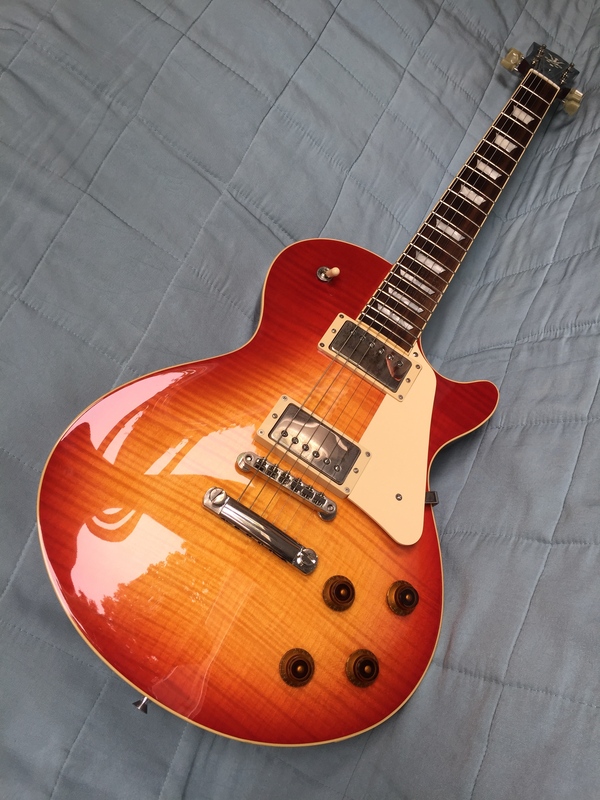 Believed to have been commissioned by Tanglewood, apparently only 1250 or so were made, before Gibson issued a cease and desist order – ironically making these rarer, than the 1500 ‘58-’59 Les Pauls they sought to emulate! This one came, “shop soiled”, in original pretty much flawless condition. The allure of the “outlaw” status of this guitar, with Jimmy Page nous and Siren-Triton headstock crown, is as fitting a tribute to Les Paul as anything else out there.